You won't find family history music videos on cable television, but you will find them online thanks to the Crisptones Band and RootsTelevision. 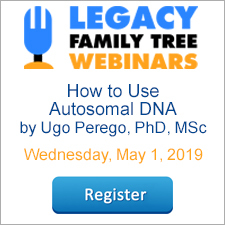 Are you new to using Legacy Family Tree? We've created a special LegacyNews tips page just for you. We have gone through the 700+ LegacyNews articles and selected the articles that best help new Legacy users get started in the right direction. The link to the new beginner's page is found at the top of this web page. Click on the link which reads "New to Legacy? Read these first" (it's right under the colorful banner at the top). Do you have a beginner's question? Don't be afraid to ask! Send me an email and maybe we can turn your question into a LegacyNews article that other beginners can benefit from too. Here's a brick wall solution that you may not have tried. Tear down your wallpaper and look for genealogical clues. This is what a Lafayette, Indiana resident did recently. But she wasn't hunting for ancestors - she was renovating her dining room. She found a marriage inscription for a possible relative of mine. My Goaz family (step-children of Asa Clark Brown) lived in Lafayette, and although I have not yet made a connection of H E or D B Goaz to the family, I'm anxious to pursue this. Although not a genealogist, the resident clearly knew this was an important discovery, and should be preserved before she painted over it. She first looked in the local telephone book, and not finding anyone with the Goaz surname, she did a search online. She located a Surname List page for Tippecanoe County, Indiana where apparently I registered the Goaz surname some time ago. How about you? What unique discoveries have you uncovered? As you may have experienced too, keeping multiple databases has its pros and cons. You might want to re-read our article entitled Your Legacy Database - Should You Split It? for some of these comparisons. If you currently have your information spread apart in multiple databases, and you want to combine it back into one master database, follow the instructions below. Navigate to and select the other database which you want to import. Click the Open button. 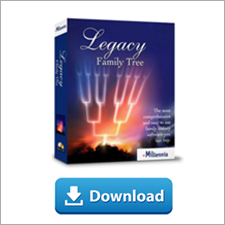 On the Import a Legacy File screen, select the second option to Add the Legacy information to the EXISTING Family file and click Proceed. Legacy then asks if you want to make a backup before proceeding. It's always a good idea to do this. If you have not yet made a backup of your main database, click the Cancel button to create your backup (File > Backup), then start over with these steps. Click the Continue with import button. On the Legacy Import screen, look at the options, especially those on the Privacy tab to ensure that you will import everyone that you want to. Then click on the Start the Import button. When the AutoSource Reminder screen appears, just click on Don't Assign a Source. Now that the "other" database has been imported into your master database, it is very likely that you will have duplicates. For example, you and your spouse's information may have been entered into both databases. In any case, we recommend clicking on the Go To Merge button that is now visible. When the Merge Options screen appears, click on the Continue button and Legacy will present to you, side-by-side, any possible duplicates. Using the Merge buttons at the bottom, compare and merge any possible sets of duplicates. When this process is complete, follow steps 1-6 above for any additional databases that you want to import into your master database. The end result will be that you have one larger master database that contains everything about everyone you are related to. Now it should be easier to avoid some of the pitfalls of maintaining multiple databases as described here. The 6th annual Legacy Genealogy Cruise is only four months away now (we leave September 5, 2009). We're delighted that so many of you have already signed up. We're excited to see places like Rome, Athens, and Venice. We're also getting ready for a great assortment of Legacy classes. If this cruise is anything like our previous trips, you will enjoy the company of other like-minded genealogy enthusiasts and develop lasting friendships. If you are single, we are looking for one single male and one single female to share a cabin with another of our Legacy guests. Let us know if you are interested, or want more information. Airfare prices have dropped recently making the cruise even more affordable. Come with us for the experience of a lifetime. Visit http://www.legacyfamilytree.com/CruiseInfo_2009med.asp for information about where we are going, what we will see, and the lineup of genealogy classes. Book now as we only have two weeks left for our current locked-in low rates. The next version of Windows is almost here. Today Microsoft released its "release candidate" for the public to download for free. A release candidate is a pre-release, meaning, it has been beta-tested, and is likely the software that will be packaged for the retail market. Windows 7, in its release candidate edition, will be available for free until June 1, 2010. Starting on March 1, 2010, if you have installed the new operating system, your computer will shut down every two hours until you install the licensed version. I personally would not suggest installing pre-release software, especially an entire operating system, for use with your one copy of every-day critical data. After all, you would also have to backup all your files and reinstall all your software (unless you are currently using Windows Vista). But if you are one of those techie nerds like myself who wants a jump on all the latest software, I suggest that you install Windows 7 in a "virtual PC" environment or on a spare computer. Using Microsoft's free Virtual PC 2007 or Sun Microsystem's free VirtualBox, you can run multiple operating systems at once, on your one computer. Microsoft suggests that only experienced computer users download the software. If you really want to try this out, click here. For a preview of what's coming, click here. A lot of the initial reviews are actually quite good.